If you've got your iPhone, your passport and, okay, also a battery charger, then you're ready to go anywhere. AppleInsider recommends apps for every stage of your journey. It's not as if we didn't travel before iPhones existed but at this point it is a little hard to imagine how. Today, that little device is the best way to find your flight and hotel. 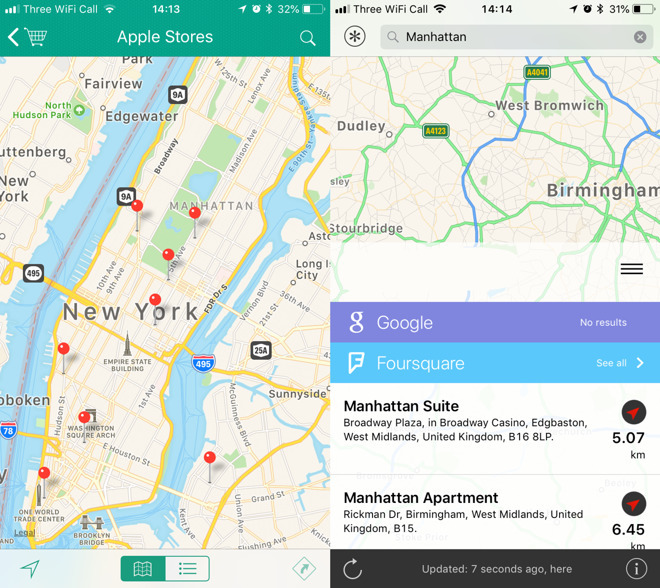 The same device will handle your itinerary, it will give you better information than your airport does, and it will get you around your destination too. Or it will if you have the right apps. 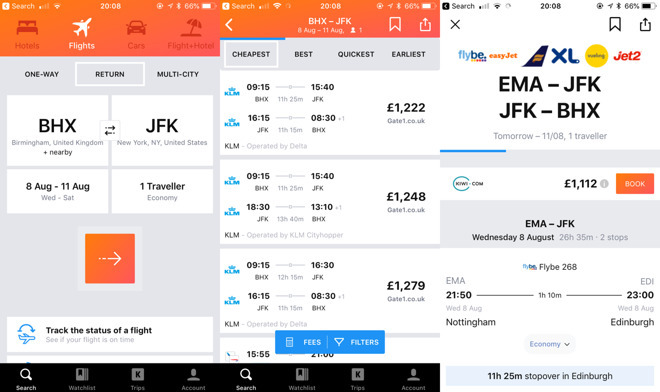 AppleInsider has a few recommendations for every step of your trip from finding a flight to what you do when you arrive. Kayak. This is a combined search and price comparison website wrapped up in a well-done app. As with any service that offers to find you the lowest prices, you could actually beat it if you tried. No comparison service actually compares all prices. That's partly because it could be impossible to add every conceivable website selling travel. However, it can also be because some travel firms refuse to be included in these comparison listings because they disagree with the fee such services charge them. So neither Kayak nor any comparison service is guaranteed to have every travel business listed. Which means that if you wanted to get out your Numbers spreadsheet and haggle with every hotel and airline —and car hire —then there is no doubt you could get a better deal than Kayak will find you. You'd just take longer to do it than your vacation or business trip is scheduled for. How much is your time worth? Given that all such services have their limitations, we recommend Kayak because it takes us seconds to use. Some of that is because we've used it a lot but then we use it a lot because it gets us the results we want. Plus, it is a simple step by step tool that holds your hand through the process. To book a flight, you say where you're coming from and going to. This shot shows a trip from Birmingham International Airport in the UK to New York's JFK. US-based fliers may not know that the Birmingham airport's short code is BHX and while we could've guessed at the latter's, we didn't need to. Kayak popped those in and then when we picked a day and a number of travelers, it started searching. Flight searching takes a while. You're best off leaving it for a few minutes, actually letting your iPhone sit there and chew on the request. Although Kayak does return some results immediately, it also keeps adding more. 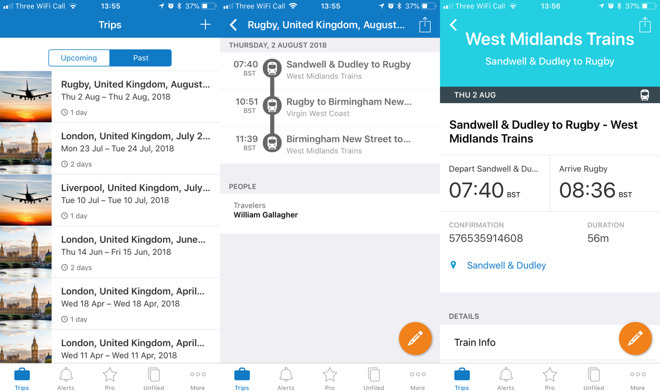 That's especially useful if you tap the Cheapest button: the least-expensive route will be at the top of the list and it will change many times as the search continues. Then you can tap on any suggested route and check the details. This BHX to JFK route seems to involve a stopover in every single country in the EU so we could just go back and check the next for a more sensible journey. Hotel booking works the same way and so does car hire. You can combine the hotel and flight search into one for convenience. Then you pay for the ticket and the airline or hotel emails you booking details. As soon as those booking emails come in, forward them straight on to TripIt. This is a service that parses the information on the booking email and slots it all into a neat itinerary. 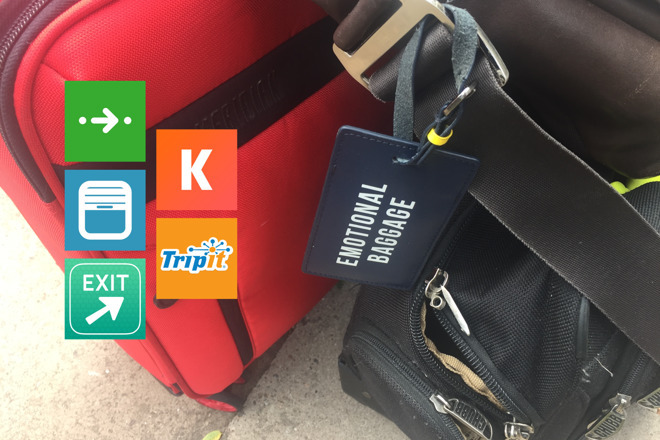 If you're only doing one trip then that seems like overkill and one reason we would still use it in that case is just that we've set up a Mail rule to do it automatically. Even with one trip, though, you do tend to be coming back home again afterwards so that is immediately two journeys. There might be a train and a plane, probably a hotel in the middle, and TripIt has the details for it all. So while you're actually en route, TripIt can show you the next thing you have to do or the next place you have to be. This saved us on a cross-France trip where we had three minutes to change trains —and the station guards pointed us in the wrong direction. TripIt has a clever touch: everyone who uses it just forwards their booking emails to [email protected] The service sees what email it was sent from and that's how it knows to add this detail to your account on the TripIt website. The great majority of what TripIt is good for is free. The app has just been updated to include embassy information, currency conversion and other details but it's the core features we recommend. 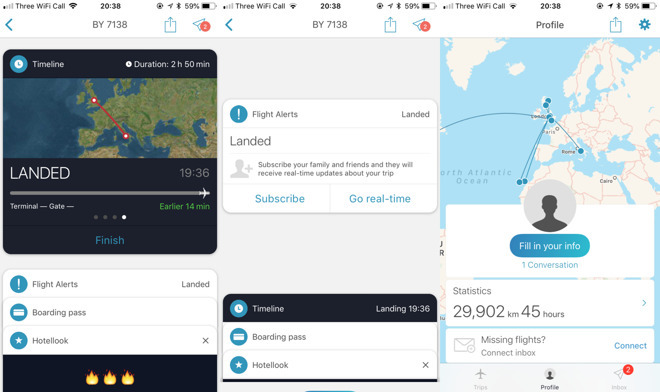 There is also a TripIt Pro tier, available via the website, which adds live flight tracking information and various niceties to do with sharing business trip details or information. It is increasingly likely that your boarding ticket will be electronic but with so many airlines and airports doing this in different ways, there's no useful recommendation to give you. Nobody's going to go to LA instead of Washington DC because the airline uses Apple Wallet. However, regardless of which airline and which airport you use, get App in the Air. Then import your flight itinerary into it from TripIt. When you're at the airport, App in the Air keeps you up to date with when you're due to get to Check-In, when you're supposed to be Boarding, and so on. All of this is free but you can choose to pay for premium features. These include having notifications of changes to boarding times or gates, for instance. The premium features cost $29.99 for one year or $49.99 for lifetime access. Even without the premium features, we've sat there in a lounge refreshing the app because the airport's screens were at an awkward angle. 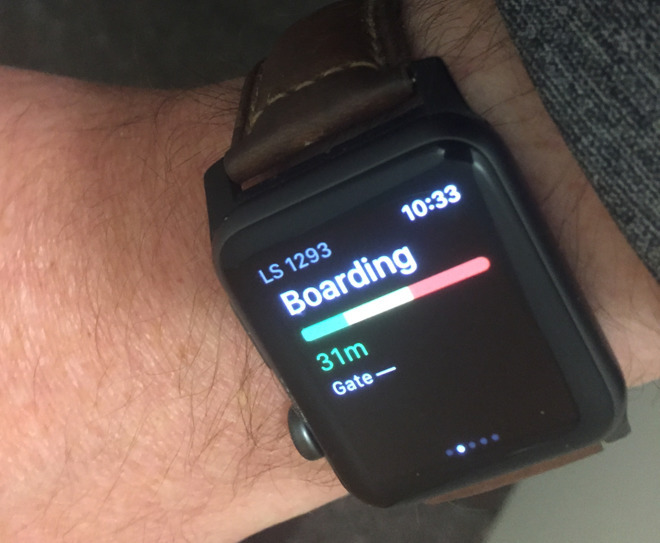 App in the Air was faster at showing us when our gate had changed and what's more, it told us on our Apple Watch. Sold. App in the Air is free in the App Store with in-app premium extras. The odds are that you're fine with how to get from the airport to your hotel. If the hotel didn't try to sell you a ride, there are cabs outside. It's when you get to the hotel that apps become useful again. If you're on vacation with your family then you'll want to eat. If you're on a business trip you'll want to eat somewhere you can meet a client or a colleague. This is one area where we use two apps, though usually it's just ">Where To? This is an app that lets you tap to say you want the nearest Indian restaurant and it will find you all of them in the vicinity. It includes opening times, website details, booking phone number, and directions. When we're more in an exploring mood, when we've got time to just look around, we also use Localscope. This is a quick guide to what's around you, divided not by categories but by how Localscope found the information. So there will be entries about restaurants from Yelp and attractions from Foursquare. There will also be recent comments and photos from Facebook users in the area. Assuming you haven't gone to Vegas where your entire week-long trip could be in a single casino, your trip is going to require you to move around the area. Use Citymapper. So long as it works in the city you're visiting then it is a superb guide to every possible way of getting around. Tell it where you want to go and, if you need to, also when you've got to be there and it will show you the way. It will show you the way by walking, driving, cycling, using Uber or by public transport. 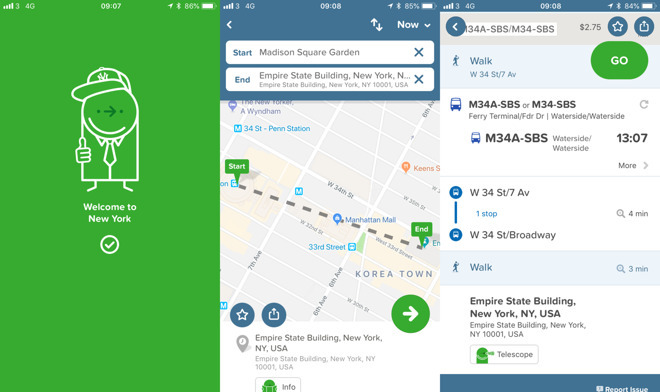 Citymapper is limited by the data it can get from the cities themselves and it's also a little limited in how many places it works. Currently it's available in 39 cities worldwide though this list is expanding. Citymapper is free on the App Store though we'd gladly pay for it. These are the essential apps you need but there are others that it would be handy to have. That's not least because just as the iPhone has changed how you travel, it is changing how companies treat you on the way. Both United and American Airlines have already ditched that little inflight entertainment screen in the back of seats for their short-haul routes. All those screens and the equipment to run them adds weight and everyone is watching their phone or iPad anyway. You can't blame the airlines but you also can't be anything but glad. The films they'd screen were edited, they were sometimes squashed into a square display and often that monitor had a fault. Then just at a crucial moment in the drama, everything would freeze as the captain makes an announcement. So it's no loss if all flights end up without these screens or at least it is if you have your own alternative. If you want to watch movies or TV then your iPhone can play back anything you've already downloaded from the iTunes Store. Since you've already got to plan ahead for iTunes, though, take look at Netflix too. Netflix now allows you to download some of its programming to watch offline. It's not a great proportion of the service's library and it's hard to know without checking each title which is or isn't available. However, if it's a Netflix original production of the last year or so, it will be downloadable. Netflix costs from $7.99 per month and the the iOS app is free to download on the App Store. So now with one device and half a dozen apps, you can just pick up your passport and be heading to the airport.